The PB Supplements shaker is possibly the best sports supplement bottle on the market today. IT will help you to produce the smoothest drink with minimal effort. The wire blending ball acts just like a whisk or blender, breaking down your powders in your liquid of choice. Simply shake the bottle and the blending ball does the rest for you...easy! The secure screw lid top ensures no spills from the shaker. 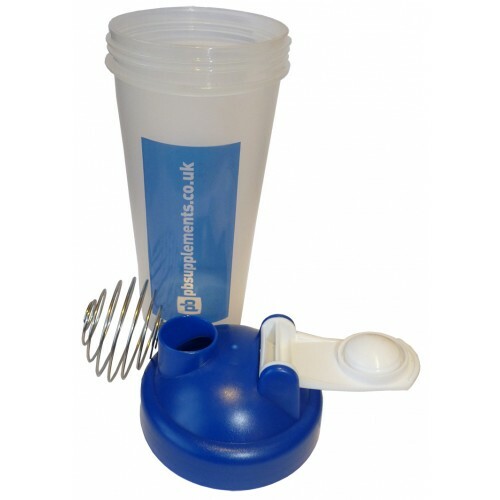 The shaker has a wide spout and flippy cap to aid the easy replenishment of vital nutrients from your mixed powders. Completely dishwasher friendly, the shaker has an easy grip shape and large 600ml capacity making it the best designed drinking bottle on the market. It is very functional and stylish!